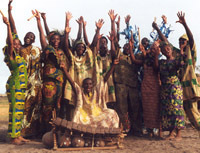 Emmanuel Gomado established a centre for drumming and dancing in Teshie/Ghana in 1988. One year later observing the lessons children of the neighbourhood got inspired and asked him whether he could train them as well. 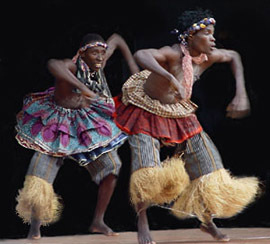 That was the beginning of Odehe in 1989: Emmanuel Gomado started to train them and they had small performances on parties or funerals in the neighbourhood. During the years the group increased up to 32 members. After eight years of intensive work and exploring the subject Odehe was inaugurated officially at the Centre for National Culture (Art Council) in Accra on the 4th of April 1997. On that day the dance drama "Spirit of Rhythm" created by Emmanuel Gomado was outdoored in presence of qualified professional experts chaired by the late Professor A.M. Opoku, the renowned authority on African music and dance at the Institute of African Studies, University of Ghana, Legon. Because of the spec- tacular performance Odehe was awarded "Best Choreo- graphy Performance and Best Performance of the Year" in 1998 and 1999. Since then that prize has not been awarded once more. 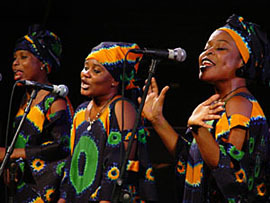 1999 Odehe went on tour in Ghana with "SPIRIT Of RHYTHM". The success of Odehe was not least based on constant cul- tural exchange with many indigenous ethnic groups around West and South Africa. Up to today Odehe is deeply interes- ted in developing its cultural knowledge by cooperation with traditional groups of other African countries. In the frame of advanced training projects in mutual agreement they work with them in their homelands and invite them for training to Ghana as well. 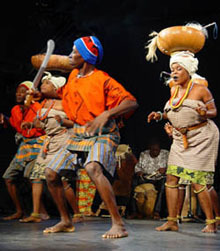 That’s one reason why Odehe boasts of a large and substantiate repertoire of traditional ethnic rhythms, movements and songs from all over Africa. Therefore Odehe has often been invited to perform at state protocol programs, diplomatic corps meetings, official and private ceremonies. Beyond that for years Odehe has been engaged by the West Virginian University summer program. With a small ensemble Odehe was already in 1999 on tour in Norway and Germany and in 2000 in South Africa. In 2001, 2003 and 2004 Odehe was on very successful tours in Germany. With a large ensemble Odehe highly impressed the stunning audience in 80 concerts at big festivals and concert halls within the whole country. In 2005 Odehe designed and perfor- med the annual cultural event "National Night 2005" for a major swiss insurance group.